Yes. It is that time of year. The time of year when the quintessential sports publication, Sports Illustrated, drops all pretense and gives men what they really want; incredibly hot women dressed in tiny little bikinis. But we're talking about advertising here, not incredibly hot women in tiny little bikinis so stick with us. 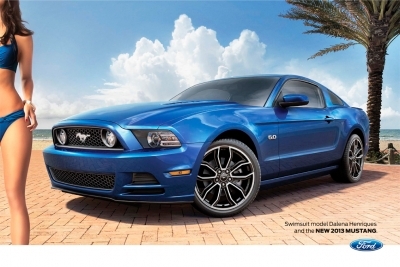 Acknowledging men's desire to see as many incredibly hot women in tiny little bikinis as they possibly can, Ford placed an ad for the 2013 Mustang in the Swimsuit issue that showed the vehicle and a bikini-clad model who is only partially shown. The ad is tagged "swimsuit model Delena Henriques and the NEW 2013 Mustang." While there is no web address, Ford knows better. Ford knows that when men are teased, they want it all. Ford knows men will Google Dalena all day long until they get what they want. Thankfully, her website appears at the top of search results. The website, much like the ad, shows Dalena posing in more pictures alongside the 2013 Mustang but, also like the ad, she is partially cropped out leaving the true mystery of who Dalena Henriques alive and well. We smell a job for Who Is That Hot Ad Girl. Absolutely brilliant work here by Ford. A perfect marriage of commerce and content. Not to mention a brilliant nod to the forever entwined relationship between hot cars and hot women.